Here from today’s Financial Post, an analysis by Peter Foster on the International Energy Agency and its report, The Power of Transformation–Wind, Sun and the Power of Flexible Power Systems. Let us just say at the outset, that we in Ontario’s rural and small-town communities will be the worst hit victims of this experiment. It was depressing to read this week of Caisse de depot head Michael Sabia regurgitating the foundational myths of economic nationalism: that markets are too short-term, and that takeovers by foreign “tourist” corporations should be resisted. That was the precisely the kind of thinking that, a generation ago, got us PetroCanada and the National Energy Program. Petrocan relentlessly spouted that its perspective was broader and longer than that of its market rivals. The result was a carnival of waste and a gusher of red ink. The NEP got every far-sighted projection dead wrong. Government-promoted takeovers sunk the acquirers, not the targets. How soon we forget, if, that is, we ever knew. The self-serving misrepresentation of capitalism that was at the heart of both nationalism/fascism and Communism is still with us, only now it’s gone global, is called sustainable development, and is focused on climate change. This allegedly demands a carefully-coordinated decarbonization of the global economy, balanced with wise guidance of poor country development. A report this week from the International Energy Agency – The Power of Transformation – Wind, Sun and the Economics of Flexible Power Systems – is a classic example of the immutability of bureaucratic pretension and its infinite ability to explain away failure, even as it promotes more of the same. Wind power and solar photovoltaic (PV) are expected to make a substantial contribution to a more secure and sustainable energy system. However, electricity generation from both technologies is constrained by the varying availability of wind and sunshine. This can make it challenging to maintain the necessary balance of electricity supply and consumption at all times. Consequently, the cost effective integration of variable renewable energy (VRE) has become a pressing challenge for the energy sector. Translation: renewable energy is a practical disaster. Everywhere, policies based on subsidization of “technologies of the future” are in crisis. “Variable Renewable Energy,” VRE, is Orwellian Newspeak for “Unreliable Renewable Energy,” URE. Unintended results have been piling up like a mountain of biomass, hoisting prices, undermining manufacturing, and creating fuel poverty among consumers, including now even those in Germany, which is still Europe’s richest country despite some of the continent’s most perverse energy policies. As the summary says, wind and solar are obviously unreliable because the wind does not always blow, nor the sun shine. They are also very expensive. Solving the latter problem is always just over the horizon, not least because those short-sighted agents of the market keep coming up with new and cheaper sources of fossil fuel, such as shale gas, a development which far-sighted bureaucrats somehow failed to spot. So what’s the IEA’s answer to the unreliability problem? Bigger and better-coordinated plans, bolstered by positive verbiage. According to the report, any country can reach high shares of wind and solar power “cost-effectively.” All that’s required is to forget history, economics and, while we’re about it, developments in climate science. The science is settled. The self-serving misrepresentation of capitalism that was at the heart of both nationalism/fascism and Communism is still with us, only now it’s gone global, is called sustainable development, and is focused on climate change. According to IEA Executive Director Maria van der Hoeven “Integrating high shares of variable renewables is really about transforming our power systems.” What is required is a “change of perspective,” which is to say the same old perspective dressed up in new imperial costume. Which is to say, the same old new imperial costume. You see, the problem was never really unreliability per se, it was that wind and solar were introduced piecemeal on top of all those awful “business as usual” systems. So what is needed is transformation of energy systems “as a whole.” You know, like the Soviets’ Gosplan. The IEA notes that wind and solar now account for just 3 percent of world electricity generation. However, a few bold leaders generate 10-30% of their electricity, albeit spottily and expensively, from wind and sun. These champions include Germany, Italy, Ireland, Spain, Portugal, and Denmark. All are struggling with policy perversity. Germany’s abandonment of nuclear has – due to aforementioned wind and solar unreliability – led to a boom in one of the “dirtiest” power sources, brown coal. Ontario PC Leader Tim Hudak has renewed his call for a province-wide moratorium on industrial wind turbines following news that the HAF Wind Energy project was built in direct violation of setback requirements established in the Green Energy Act. WEST LINCOLN — Tim Hudak has renewed the call for a province-wide moratorium on new industrial wind turbine projects. Last week, in an open letter to Energy Minister Bob Chiarelli, Hudak requested the Liberals implement an immediate moratorium on future projects in light of “the recent chaos” in West Lincoln. The chaos the Ontario PC Leader is referring to is the revelation that four of the five HAF Wind Energy turbines do not meet setback requirements established by the ministry. Hudak said the ministry’s response is “unacceptable.” Since The News reported on the issue, it has come to light that four of the turbines infract on the minimum property line setback distance, rather than three as initially reported. Hudak has called on his Liberal counterparts numerous times to initiate an immediate moratorium on wind projects due to ongoing concerns of Ontarians in relation to health, plummeting property values and a loss of democratic rights. The Niagara West-Glanbrook MPP says the government needs to scrap the expensive Green Energy Act and focus on putting Ontario’s economy back on track — which includes reining in out-of-control energy costs. Hudak said the Liberal’s “expensive energy experiment” is a failure that has done nothing but drive hydro bills through the roof, cost Ontario jobs and divide communities down the middle. Hudak’s plan to put Ontario back on track was introduced Feb. 18, when legislature resumed. His Million Jobs Act will be debated at Queen’s Park Thursday. Bow Lake project could interfere with Environment Canada radar? But here’s another situation, like the airports, the produce growing operations, the schools, the homes, where wind power has the potential to interfere with operations that are for the public good. Environment Canada has raised concerns that proposed wind towers on Bow Lake could severely block or contaminate Canada’s weather radar network. The concern was raised in a report dating back to December 2012 that raised concern that the Bow Lake Wind Farm could contaminate the radar data at the Montreal River weather radar station. In turn, that will impact forecasters at the Ontario Storm Predication Centre and the Aviation Forecast Centre, among others. Environment Canada concludes that the Bow Lake Wind Project and the Montreal River weather radar will not be able to co-exist without negative impact on weather radar users. The argument is expected to be raised at an Environmental Tribunal Hearing expected to start in early March into the appeal of the Bow Lake Wind Facility. The tribunal’s scope is limited to issues that deal with the proposed farm causing serious harm to human health or serious and irreversible harm to plant life, animal life or the national environment. The 23-page report from Environment Canada was submitted to BluEarth Renewables Inc. as an official comment made during the 60 day public review period of the draft REA submission documents. The report states that local weather forecasts and severe weather warnings will be affected. “The Montreal River area is prone to lake-effect snow squalls. These narrow bands of weather are very shallow and the lowest radar scans, nearest to the ground, are used to track their evolution. If the low level data is contaminated, the radar would be unable to monitor the accumulation of show in regions beyond the wind farm,” the report states. It states that the accurate weather reports in that area don’t only just impact the public, but also the Ministry of Transportation, the Ontario Provincial Police, NAV Canada and the Department of National Defence, all of whom utilize weather forecasts and weather radar observations. Environment Canada’s weather radar system includes 31 radars across Canada, 28 of which are owned and operated by Environment Canada, two by the Department of National Defence and one by McGill University. Factors that can affect the quality of the data include wind turbine towers, buildings, trees, towers and terrain, all of which can block energy travelling to and from desired targets. The blockage can result in the lost of meteorological information. In the meantime… to continue the fight to protect this area from unnecessary and unneeded industrial development, the call is out for people to show up in the Sumac Ridge project area next Tuesday March 4th at a little after 11 am. The Toronto based Chinese TV Network, Fairchild Television is coming out and would like to interview COKL Councillor Heather Stauble and Cavan Monaghan Deputy Mayor Scott McFadden as well some of the protestors who were in Toronto and other concerned residents. There will be a very brief meet-up at Rolling Hills School at 11 am with Manvers Wind Concerns and then a convoy to the heart of the Sumac Ridge project. The call is out by Manvers Wind Concerns for people to show up at the corner of Wild Turkey Road and Ballyduff Road at a little after 11 am with signs… MWC will also supply signs. The safest way to approach Wild Turkey Road is from Highway 35 via Ballyduff… Wild Turkey Road is NOT maintained. The main hearing for an appeal against the Bow Lake Wind Farm project has been rescheduled to 11 a.m. on Monday, March 3, 2014 at The Days Inn at 332 Bay Street in Sault Ste. Marie. The Ontario Ministry of the Environment (MOE) approved the Bow Lake Wind Farm project December 16, 2013. The Bow Lake Wind Farm project is a partnership between Nodin Kitagan of Batchewana First Nation (BFN) and Calgary’s BluEarth Renewables. The Bow Lake Wind Farm project, a plan for 36 wind turbines, is to be located on traditional BFN land approximately 80 kilometres north of Sault Ste. Marie. In early January, Save Ontario’s Algoma Region (SOAR) spokesperson Gillan Richards and Lake Superior Action Research Conservation (LSARC) Co-Chair George Browne announced by email that James Fata and 2401339 Ontario Ltd. (a corporation resident in Ontario) will request the Environmental Review Tribunal (ERT) revoke MOE approval of the Bow Lake Wind Farm. 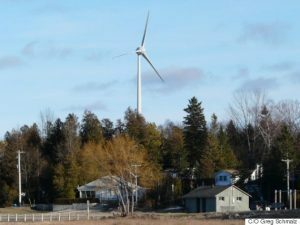 Groups such as SOAR and LSARC state they are opposed to wind farm development in the Sault and Algoma region, maintaining that wind turbines are hazardous to human health and wildlife, an environmental disruption, and spoil the natural, rugged beauty of the Algoma landscape. SOAR and LSARC say Fata is challenging MOE approval of Bow Lake on constitutional grounds, questioning whether the project’s approval has violated his right to security of the person as granted under Section 7 of the Canadian Charter of Rights and Freedoms. A preliminary hearing was held January 28 and continued by teleconference January 31, February 7, 14 and 21. The March 3 main hearing will include opening statements for all parties. The appeal by 2401339 Ontario Ltd. will be heard at 9 a.m., March 3 to 7, 2014, and at 9 a.m. March 17 to 21, 2014. James Fata’s appeal will be heard at 9 a.m., March 25 to 27, 2014. All meetings will take place at The Days Inn. Cheryl Gallant, the MP for Renfrew-Nipissing, spoke about Canada’s nuclear power sector in the House of Commons on Wednesday. Here is a portion of her remarks, as they relate to the electricity situation in Ontario. These and other like-minded individuals are urging those individuals who are truly concerned about the environment to support the development of safer nuclear energy systems, such as Canada’s success story, the CANDU system. No energy system is without downsides. We ask only that energy system decisions be based on facts, and not on emotions and biases that do not apply to 21st century nuclear technology. […] the time has come for those who take the threat of global warming seriously to embrace the development and deployment of safer nuclear power systems as one among several technologies that will be essential to any credible effort to develop an energy system that does not rely on using the atmosphere as a waste dump. Here from Manvers Gone With The Wind, a report on the ERT from City of Kawarth Lakes Councillor Healther Stauble. Sumac Ridge ERT UPDATE Feb 26th- Hearing Adjourned until April 8th!!! I am attaching a copy of the Order that was issued yesterday regarding the Environmental Review Tribunal on the Sumac Ridge Wind Project adjourning the Hearing until at least April 8th, 2014. At the beginning of this process, the Director at the Ministry of the Environment came forward acknowledging that a noise receptor had been identified that was within the 550m setback established under the Green Energy Act regulations (O. Reg 359-09). The Tribunal has now cancelled all Hearing Dates and called an Adjournment until April 8, 2014 at which time the Tribunal will re-assess the status of the proceedings. The Director at the Ministry of the Environment must now bring forward his decision to revoke, amend or take no action in writing. If the turbine that is currently within the 550m setback is not eliminated from the plan, and either moved or left in place, an opportunity to comment on the revised plan would be important. In the meantime…email action required! wpd has initiated what they claim is a Municipal Environmental Assessment, WITHOUT the consent of the City of Kawartha Lakes for roads in the project area. This is NOT a municipal EA. The email contact and website are: comments@municipalea2014.ca or at:www.muncipalea2014.ca. Please copy comments to hstauble@city.kawarthalakes.on.ca. In addition, wpd has applied to the Ontario Energy Board to have access to Gray Rd. Road allowance and Wild Turkey Rd. under the Electricity Act. The posting on the Ontario Energy Board website requires that they notify adjoining landowners, the Clerk at the municipality and post the information on their website. There does not appear to have been any notice on the wpd website as of yesterday and no notice was provided to the City of Kawartha Lakes. Adjoining landowners who were NOT notified should advise the Ontario Energy Board and copy me athstauble@city.kawarthalakes.on.ca. Sumac Ridge ERT is on hold while the wind company deals with a “receptor” it claims it didn’t know about. The Prince Edward County Field Naturalists are wrong. Ontario Nature. Nature Canada. Both wrong. Dr. Robert McMurtry is wrong. The South Shore Conservancy is wrong. So too is the Prince Edward Point Bird Observatory. Alvar, bird, butterfly, turtle and bat experts are all wrong. The municipality of Prince Edward is wrong. As are the majority of County residents who believed Crown Land at Ostrander Point should be preserved—rather than industrialized for the profit of one corporation. And now we have learned that Ontario’s own Environmental Review Tribunal is wrong. A Toronto court has said so. This ought to keep Premier Kathleen Wynne up at night. The Tribunal’s Robert Wright and Heather Gibbs spent more than 40 days hearing evidence, challenging testimony and witnesses and weighing competing claims. They began their task in a snowstorm in February; and delivered their decision on a hot July day last summer. Wright and Gibbs visited Ostrander Point. They walked around. They saw, with their own eyes, what was at stake. They dug deep into the evidence. They weren’t satisfied that the Ministry of Natural Resources (MNR) had sufficiently scrutinized the developer’s plans before issuing it a permit to “harm, harass and kill” endangered species, including the Blanding’s turtle. They discovered that mitigation measures proposed by the developer to ensure overall benefit to the species were untested and worse, according to evidence presented before them—unlikely to work, particularly for the population at Ostrander Point. However, the Toronto court ruled that Wright and Gibbs should have given the MNR the benefit of doubt. “In my view, the Tribunal ought to have assumed that the MNR would properly and adequately monitor compliance with the ESA (Endangered Species Act) permit,” wrote Justice Ian Nordheimer in the decision. But Wright and Gibbs, after listening to 40 days of testimony and examining nearly 200 documents entered into evidence, concluded they could not make that assumption. The Tribunal’s error was that it didn’t believe the MNR would adequately look out for the Blanding’s turtle. The court didn’t say Wright and Gibbs were wrong about their conclusions, but that they should have “accepted the ESA permit at face value” or explained better why their conclusions were different than the MNR. “The Tribunal was obliged to explain how the fact that the MNR had concluded under the ESA that the project would lead to an overall benefit to Blanding’s turtle (notwithstanding the harm that would arise from the project) could mesh with its conclusion that the project would cause irreversible harm to the same species,” wrote Justice Nordheimer. This is the bit that ought to send a cold shiver through Premier Wynne and anyone else who is worries about the welfare of endangered species in this province. We are bombarded with information these days but in Ontario much of it is all about our electricity bills. Take yesterday, for example. An e-mail exchange with a senior officer (earning $450,000 annually) at the Ontario Power Authority on issues surrounding the revised Long-Term Energy Plan left me shaking my head as the “snow job” continues. The message from the Minister of Energy Bob Chiarelli is, basically, all Ontario’s ratepayers are stupid. Then Canada Post delivered a form letter apology from Carmine Marcello, President and CEO of Hydro One. The letter told me that their billing system is a mess and he was really sorry about that. How much did that letter cost me? Hydro One presumably paid 63 cents for the postage and with 1,221,036 customers (December 31, 2013) the cost of that letter to the ratepayers of the province was probably close to $2 million. No doubt Hydro One will include that cost in their next request for a rate increase (along with the costs of repairing that messed up billing system), so we will pay for that in our delivery rates. Hydro One also wants the opportunity to mess up more bills as they are trying to acquire another four small electricity distributors in the province. Weren’t they the distributor that spent $700.54 each for those smart meters that are now not communicating? Carmine didn’t mention that; he just told me it might take a while to sort out the problems. Then someone sent me an interesting article about a curling rinkin Welland that may be forced to close its doors because of electricity bills. One curling rink doesn’t employ many people but if, say, 60 of them close throughout the province, the job losses will add up. And speaking of job losses, the news from Thunder Bay where the local coal plant is being converted to biomass is that 50 jobs will be lost. The reported payroll of those lost jobs with OPG was $4.5 million meaning those jobs averaged $90K each (plus benefits?). Not too shabby! Several local politicians met with Minister Chiarelli to express their concern about the way Northern Ontario is being treated and he said “he was confident with the information he has received from his advisors, particularly Ontario Power Generation.” He said that, despite the fact that it was his Ministry that produced both the original and the revised Long-Term Energy Plan and issued the directive to convert the plant from coal. Makes one wonder where the Ontario Power Authority fit into the planning process and do we really need them and those employees earning $450K? Then I saw a releasefrom the Association of Major Power Consumers of Ontario (AMPCO) who expressed concern about Ontario’s electricity rates for large industrial users. Ontario has the most expensive electricity in Canada and the nearby U.S. states, AMPCO says. They want lower rates even though they are already being subsidized by the rest of Ontario’s ratepayers. AMPCO have joined the Ontario Federation of Agriculture and the Coalitionof Ontario Manufacturers for Competitive Industrial Power Rates in lobbying efforts for lower electricity rates. Who will pick up the bill for what they want? Probably the residential ratepayers of the province who don’t have a lobby group. Residential ratepayers (information released by the Ministry of Energy) consumed 29% of all electricity generated in the province in 2013, but somehow are being looked on as having the ability to now subsidize all of the other ratepayer groups in the Province. Finally the last item received today was an invitation to participate (listen) in what is referred to as the Canadian Energy Innovation Summit hosted by Premier Kathleen Wynne at the charity, MaRS Discovery District. For the MaRS year end of March 31, 2013 they reported gross revenue of $46.8 million and received charitable donations of $129,000 or .28% (slightly more than one-quarter of 1%) of their gross revenue, but received $28.4 million or 60.7% of their gross revenue from government grants (principally the Province of Ontario). MaRS have received approximately $200 million from the Liberal coffers (taxpayers) since the party won the election in 2003. As a residential ratepayer, it seems as if there is money available to support the lobbying efforts of the groups looking for lower electricity rates, but it is being directed to those close to those in positions of power and political influence. Not a great day for the ordinary Ontario citizen. The views expressed are those of the author and do not represent Wind Concerns Ontario policy.